Tropical Smoothie is a delicious way to get in some vitamin C, protein, and potassium for breakfast or as an afternoon snack! It’s loaded with orange juice, lime juice, lemon juice, banana, pineapple, and coconut extract for an extra fruity tropical flavor! 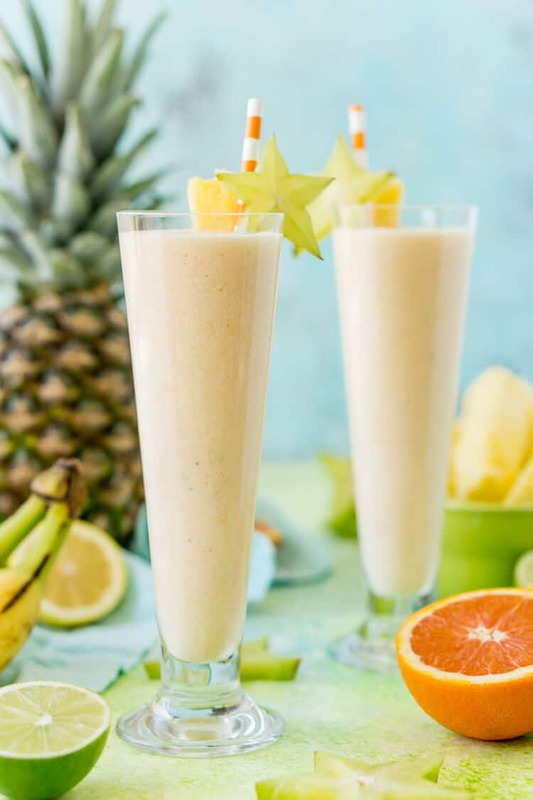 This tropical smoothie is the perfect way to kick off the morning and packs a powerful punch of vitamin C, protein, and potassium! Plus it tastes delicious thanks to all the yummy fruit that’s in it! It’s made with a secret ingredient that makes it extra creamy too! I don’t know if I’ve mentioned it before, but we listed our house on the market at the end of October. At the time, we knew it wasn’t the best season to sell with the cold weather and the holidays rolling in, but we figured it couldn’t hurt. But the last couple of weeks feels like it’s been one showing after another, and if you’ve ever lived in a house that’s on the market, you know how stressful it can be. Every dirty dish gets cleaned as soon as you’re done using it, you’re constantly sweeping what feels like whole golden retrievers off the floor (how can an animal possibly shed so much? ), and sometimes you’re kicked out of your house at 8 am after just getting home from a long trip the night before. It can be a little stressful, to say the least. So I’m thankful for quick breakfast recipes like this tropical smoothie, because if I’m running out the door at 7:45 am with my 100 lb golden retriever in tow, the best breakfast is a portable one! After visiting Hawaii in September, I kind of fell in love with the tropical fruits, we visited a local farm while we were there and you could smell the limes trees and pineapple from yards away, and I’d wished there was a way to encompass that smell and bring it home with me. 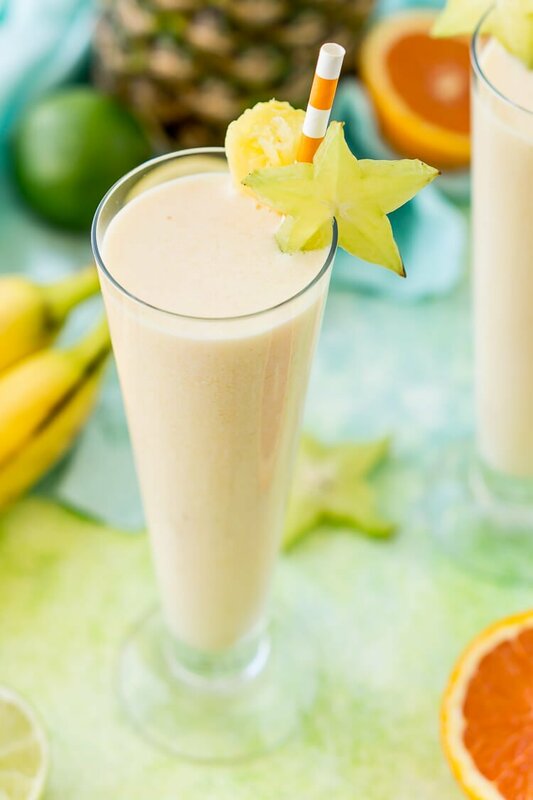 Those memories inspired me to bring those things I loved about Hawaii together into a quick and wholesome breakfast or snack with this tropical smoothie! 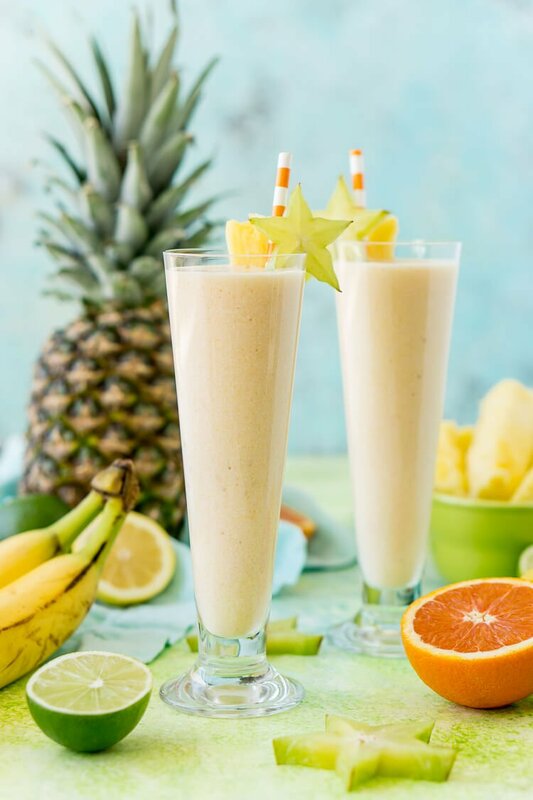 This smoothie brings together pineapple, oranges, lemons, limes, coconuts, and bananas for the best fruit smoothie I’ve EVER made! 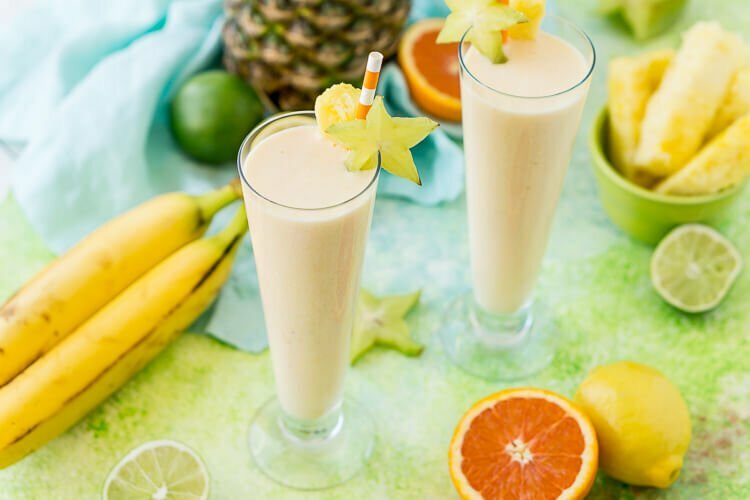 With the addition of collagen gelatin, coconut oil, and cottage cheese, this fruit smoothie packs in some vitamin C, protein, dietary fiber, and potassium! Plus, other than a small amount of coconut extract, there are no additional sweeteners, not even honey or agave in it! Just let the fresh fruit do the work! Coconut Oil – This is my favorite coconut oil to use in food and in sugar scrubs. Coconut has a lot of health benefits and a lot of household uses, so a big container can go a long way! Blender – I love my Ninja blender, it does such an awesome job and you definitely can’t make a smoothie without some sort of blender! Collagen Peptides – Collagen is great for a number of different reasons, but it’s especially good for you as you age because it helps your body repair itself quicker. I like to add a tablespoon here and there to my food. It doesn’t have any flavor and you can pretty much add it to anything. 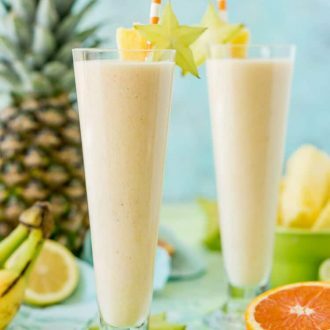 Coconut Extract – This flavoring is truly optional in the smoothie, but I really like it for that extra bit of tropical coconut flavor it adds. Tropical Smoothie is a delicious way to get in some vitamin C, protein, and potassium for breakfast or as an afternoon snack! 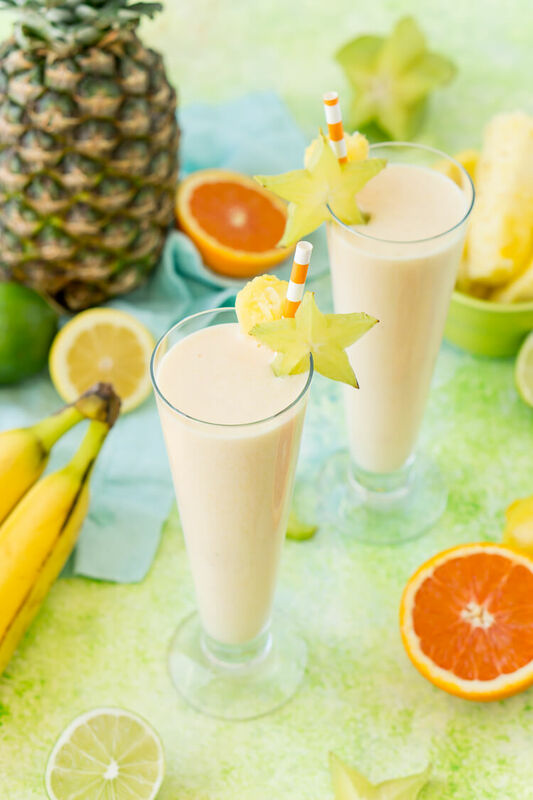 It's loaded with orange juice, lime juice, lemon juice, banana, pineapple, and coconut extract for an extra fruity tropical flavor! Combine all ingredients in a blender and pulse until smooth. Pour into glasses and serve with a straw and fruit garnishes. Pin this Smoothie Recipe for Later! What gorgeous photos — and I love coconut oil in smoothies. Adds so much flavor! These look amazing. Thank you so much! This smoothie definitely has a ton of flavor! Oh, yes, please! I would love to tackle this tropical smoothie asap. I love the video presentation… it’s gorgeous. Thanks so much, hope you get a chance to try it soon! I love tropical smoothies! Anything with coconut is delicious to me! I agree, I love coconut! Hawaii is one place that I feel like I am missing out on. This looks like a beautiful reminder that I need to work on my bucket list. You definitely do, it’s one of my favorite places int he world! Love that you added coconut oil and collagen to this! So it’s not only delicious but also good for the skin and hair. I must admit, I was excited about this recipe until I saw that it had cottage cheese in it. I know, cottage cheese is really good for you. Grudgingly, I tried the recipe, just as stated, using my Vitamix blender. And wow, to my surprise, it was delicious. 4) 2 tbsp honey (really, just add as much as needed. Some oranges are sweeter than others, so this will vary).